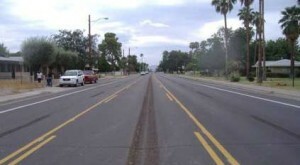 The City of Phoenix Street Transportation department just completed a landmark bicycle project. Fifteenth Avenue from McDowell Rd to the Arizona Canal received a “Lane Diet.” The former four lane arterial was reduced to one lane each direction with a center turn lane and bike lanes. Traffic engineer Kerry Wilcoxson credits City Councilman Tom Simplot for getting the project going. Funding for a bike/ped bridge across the canal has been requested. Way to go Phoenix!